Software applications are essential in today’s business environment, where internal and external services are delivered across mobile, social, collaboration, and cloud technologies. Application Performance Management (APM) is strategically important for companies that need to ensure the performance and availability of business-critical software applications -- if an application has problems that impact customers, a business can lose revenues or incur damage to its brand. With APM, line-of-business managers, IT operations and development can have end-to-end visibility of their application performance and service conditions. They can get very granular data about the end-user experience, infrastructure, application, transaction details, or code-level performance, and they can visualize it in real time. 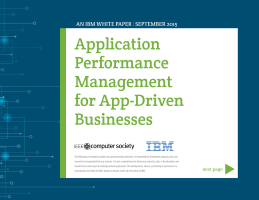 Based on a broad range of case studies, IBM has found that companies employing IBM’s APM solution can overcome the challenges described to gain significant operational, service availability, and performance benefits. Companies can diagnose problems up to 90 per cent faster by identifying the root cause of a problem, whether it originates from a component, browser, user interface, or line of code. Download this white paper to learn key benefits and capabilities that APM provides, including when to adopt, recommendations for getting start, and the role it plays in your business.